It’s a new month, and the Top Webcomics counter reset. But we made it to the top 100. Let’s do it again! I’ll even put a preview panel from the next strip up as a voting incentive. As for Hi-Tech’s new, more compact look? This is something I wanted to do since he debuted, and I think it’s going to make him a much more entertaining character. You can leave comments by clicking here, leave a trackback at http://supervillainous.spiderforest.com/comic/version-2-0/trackback/ or subscibe to the RSS Comments Feed for this post. Wish there was an edit post button. That likely becomes a running gag with hi-tech. Particularly because of how adorable and small he has become. 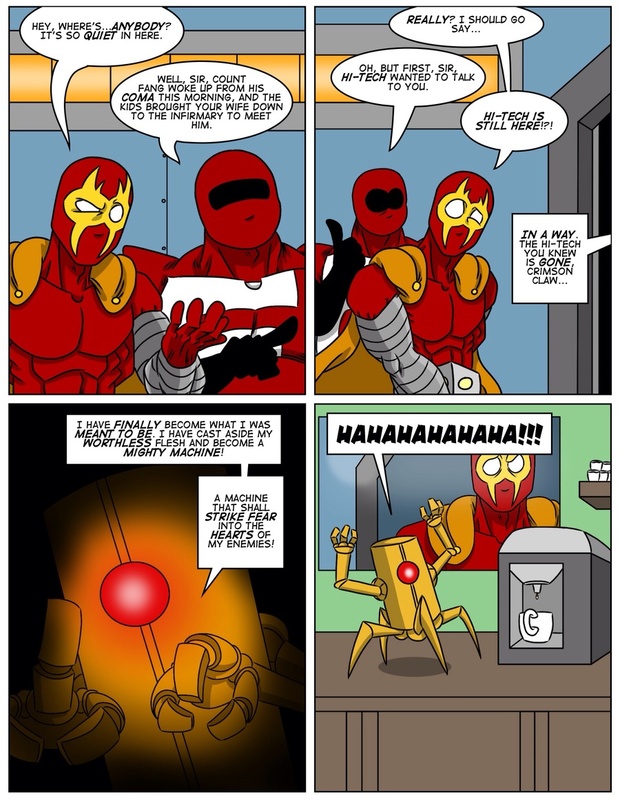 I mean, how can you not love a 1 foot tall maniacally laughing robot? Hi-tech wasn’t exactly…all with it when he was still part human. He kept crashing and stuff. So not sure he make good decisions on his own about how to spend his wealth. Didn’t think Hi-tech had unlimited gold, just whatever claw paid him. I don’t think even Claw has unlimited gold, just an amazingly abundant supply (unless he wants to risk busting out the machine again). Even if Claw is supposed to have unlimited funds, think of it like a metered attack where if you spam it, it empties and it takes a painfully long amount of time to refill. Why? Gold is worth so much not only for its properties but because its rare… but Claw actually found a way to get a lot of it, fast and added to not only the supply in his area, not only the supply no earth, but the supply for the entire universe. So… yeah, he has reason to restrain himself and anyone on his payroll. If he spends it gradually, it probably won’t affect the market significantly. Plus… being a super-villain, probably not good to draw attention to his stash. As of January 2018, Supervillainous is sitting pretty at 66. Woo! First we conquer TWC, then the country! And then, the nearest ice cream parlor! Victory shall be ours!